The M52B20 is a two-liter inline 6-cylinder engine. It was released in 1994 and belongs to M52-series which also includes the M52B24, M52B25, M52B28 and S52B32 engines. The new engine appeared to replace the old but still popular M50B20 engine. The cylinder block is made entirely of aluminum alloy with Nikasil layer on bore-liners. The engine got new pistons and connecting rods (the length is 145mm). The M52B20 head is aluminum DOHC 32-valve, which is well known as M50B20TU cylinder head. The engine firstly has the variable timing system VANOS on intake camshaft only, and simple intake manifold made from plastic. The engine uses 154 cc fuel nozzles. After 1998 the engine got the new name - M52TUB20. There are cast iron sleeves inside new aluminum cylinder block. Connecting rods, pistons, cooling system, everything was redeveloped for this engine. Now this updated version has Double-VANOS system, variable geometry intake manifold called DISA and electronic throttle body. 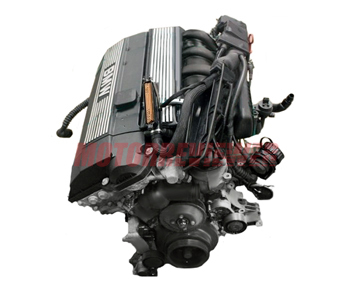 M52TUB20 camshaft specs: duration 244/228 deg, valve lift 9.0/9.0 mm. The M52B20 was replaced in 2000 by its successor from M54-series - 2.2-liter M54B22 engine. The engine doesn't have unique problems, just those are featured M52-series. Find more information about them in M52B28 engine review.